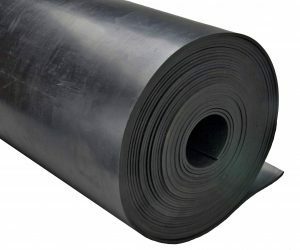 EPDM (Ethylene Propylene Diene Monomer) rubber is a high quality sheet rubber material designed for outdoor industrial applications including seals and weather stripping. EPDM rubber is ozone and sunlight resistant and performs well in cold climates. Offered in 36 and 48 inch wide rolls, it can also be slit to width or custom cut to your specifications. Also available with nylon insert for higher tensile strength. FDA white EPDM sheet is also available, minimum may apply. **Weight is for 36 inch wide material. For 48 inch wide, calculate weight per inch by dividing the listed weight by 36 and then multiply by 48.